O Gokulananda (bliss of Gokula), O Govinda, O Gosthendra-kula-candramah (mmo arisen in the family of Vraja's king), O Pranesa (master of our lives), O Sundarottamasa (crown of all hundsome men), O Nagara-sikha-mane (crest jewel of amorous heroes), O Vrindavana-vidhu (mmon of Vrndavana), O Gostha-yuva-raja-manohara (handsome prince of Vraja). 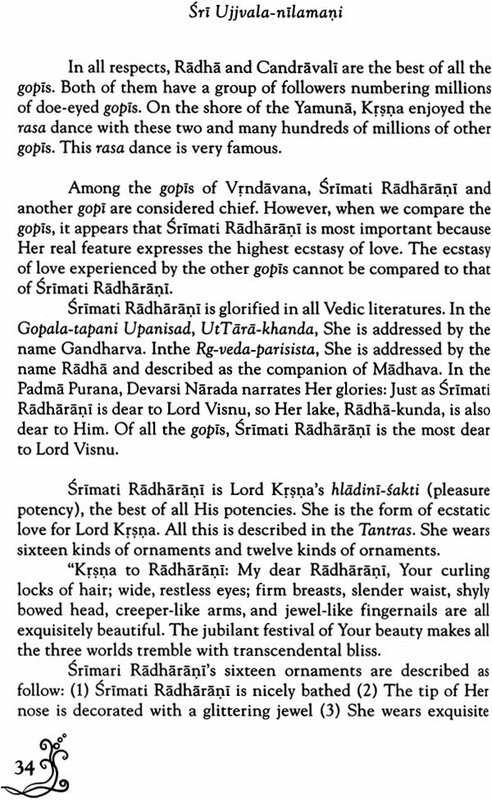 These are some of the names used by the goddesses of Vraja to affectionately address Their lover, Krisna. We should first very carefully study the Bhagavad-gita before attempting to read such a book as this. Bhagavad gita lead us to the point of surrender to Sri Krisna. 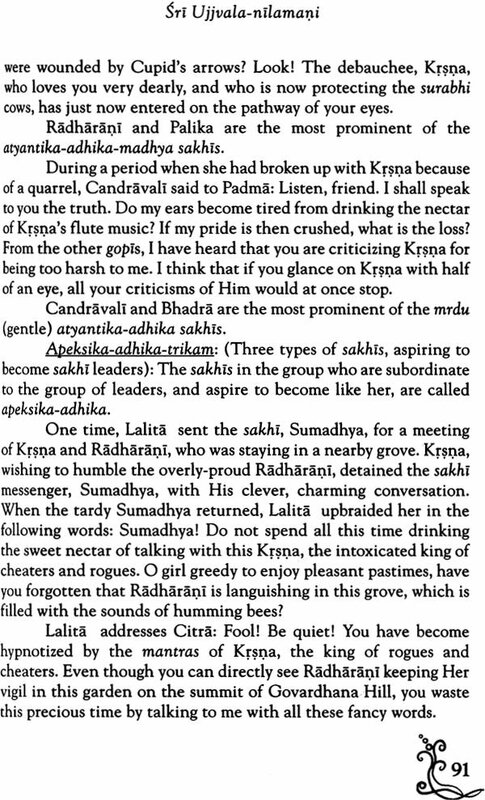 After surrender, one should begin his study of the Srimadbhagavatam, starting with the First Canto. 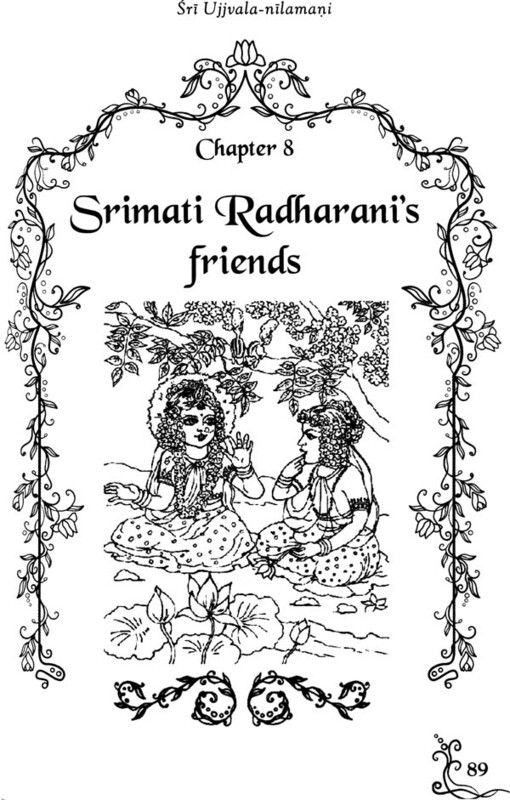 As in this book, the intimate pastimes of the Lord Sri Krisna are portrayed in the Tenth Canto of the Srimad-bhagavatam. By study of the first nine cantos, one comes to a proper understanding of the Krishna, the Supreme Personality of Godhead. Only then is one actually able to properly appreciate the Lord's transcendental pastimes. I worship Govinda, the primeval Lord, who resides in His own realm, Goloka, with Radha, who resembles His own spiritual figure and who embodies the ecstatic potency. Their companions are Her confidants, who embody extensions of Her bodily form and who are imbued and permeated with ever-blissful spiritual rasa. Because the sweet nectar ocean of devotional mellows is bottomless and shoreless, it is very difficult to enter. Standing by its shore, I have simply touched it. 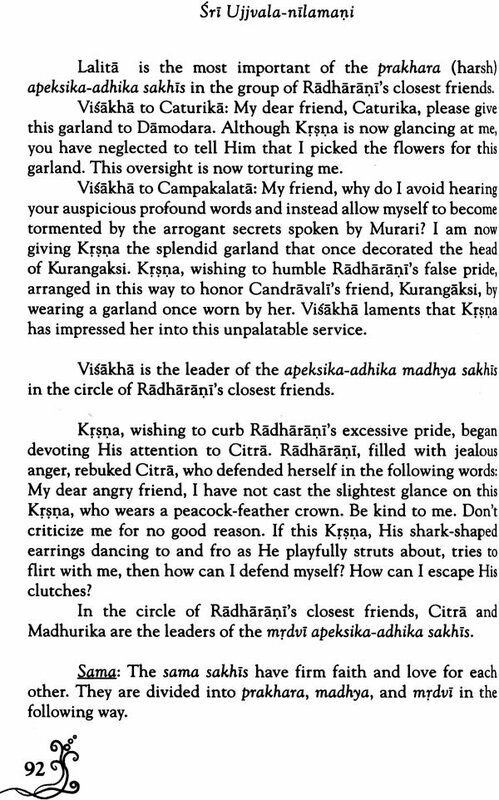 This book is a splendid sapphire (Ujjvala-nilamani) produced in the mysterious, fathomless ocean of Vrajabhumi. O Lord, I pray that this sapphire may become suitable to decorate your shark-shaped earrings. In a purport of the Caitanya-caritasmrta, Srila Prabhupada wrote: Srila Rupa Gosvami is described as the bhakti-rasacarya, or one who knows the essence of devotional service. 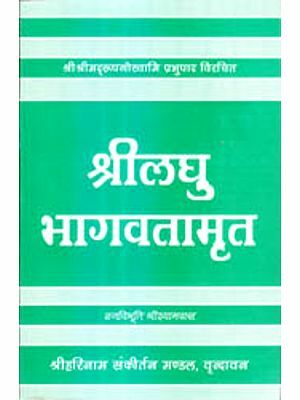 His famous book Bhakti-rasamtra-sindhu is the science of devotional service, and by reading this book one can understand the meaning of devotional service. 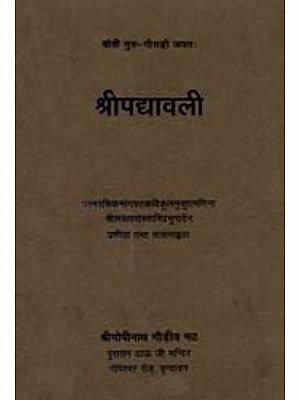 Another of his famous books is the Ujjvala-nilamani. 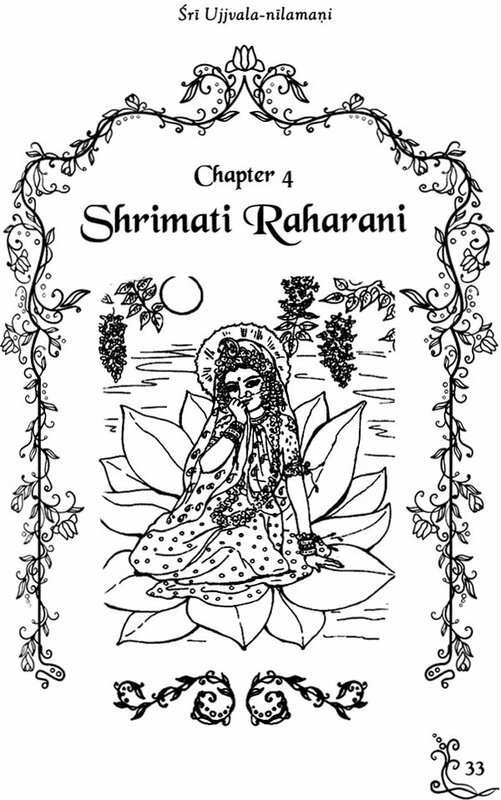 In this book he elaborately explains the loving affairs and transcendental activities of Lord Krsna and Radharani. 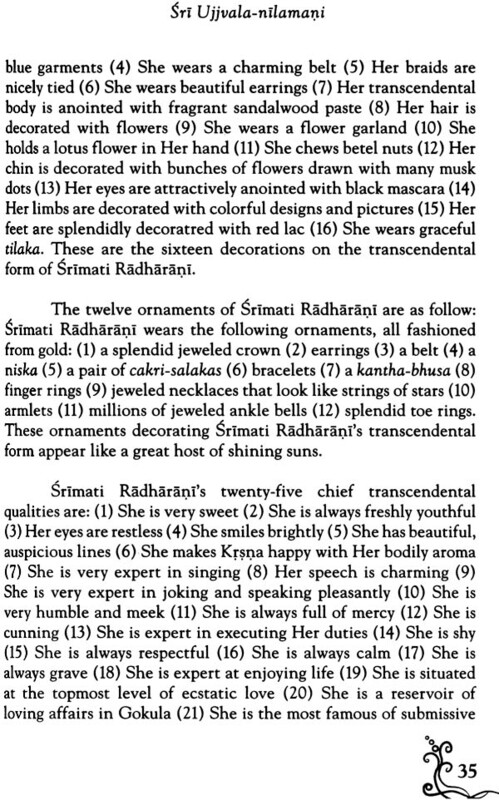 In the Bhakti-ratnakara there is a list of the books Sri Rupa Gosvami complied. 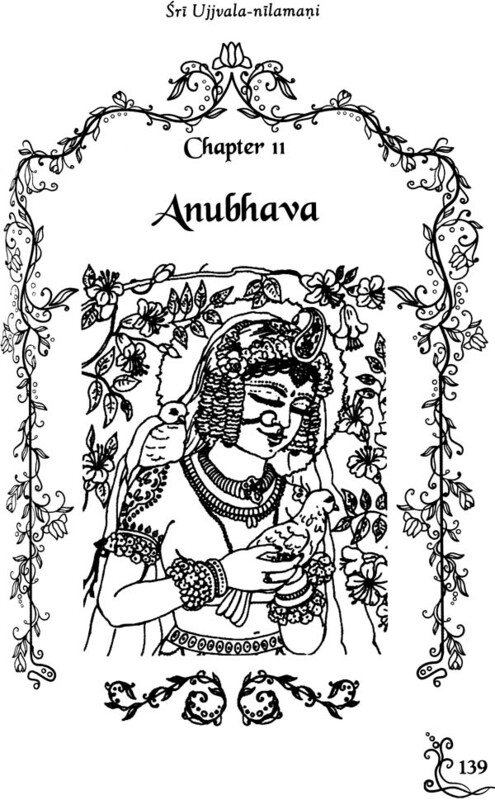 Of all his books, the following sixteen are very popular among Vaisnavas: (1) Hamsaduta, (2)Uddhava-sandesa, (3) Krsna-Janma-tithi-vidhi (4 and 5) Radha-krsna-ganoddesa-dipika, Brhat (major) and Lghu (minor), (6) Stavamala, (7) Vidagdha-madhava, (8) Lalita-madhava, (9) Dana-keli-kaumudi, (10) Bhakti-rasamrtasindhu (this is the most celebrated book by Sri Rupa Gosvami), (11) Ujjvala-nilamani, (12), Akhyata-candrika and (16) Laghu-bhagavaramrta. In the Caitanya-cartimamrta, Krsnadasa Kaviraja wrote: Srila Rupa Gosvami alos wrote many books, the most famous of which is the Bhakti-rasamrta-sindhu. From that book one can understand the essence of devotional service to Krsna and the transcendental mellows one can derive from such service. Srila Rupa Gosvami also compiled the book named Ujjvalanilamani, from which one can understand, to the fullest limits, the loving affairs of Sri Sri Radha and Krsna. Professor: Have you translated also the Bhakti-rasamrta-sindhu? Prabhupada: Yes, all of it. Nectar of Devotion. 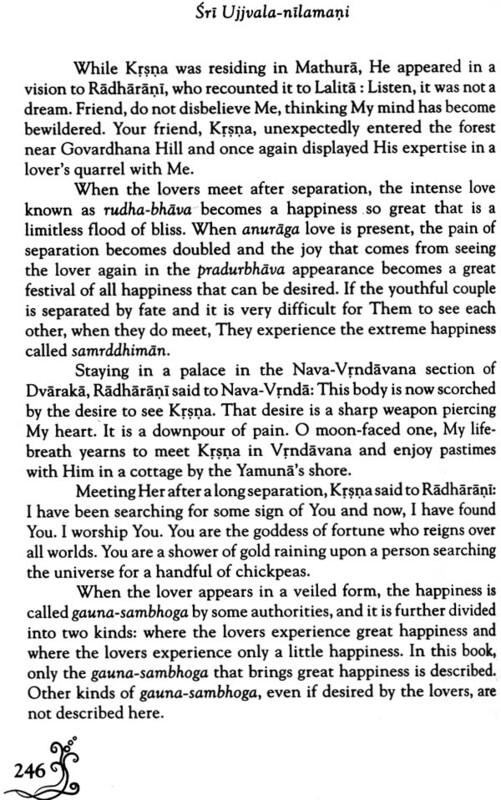 Paramahamsa: Do you have, Nectar of Devotion? Professor: And also this Ujjvala-nilamani. 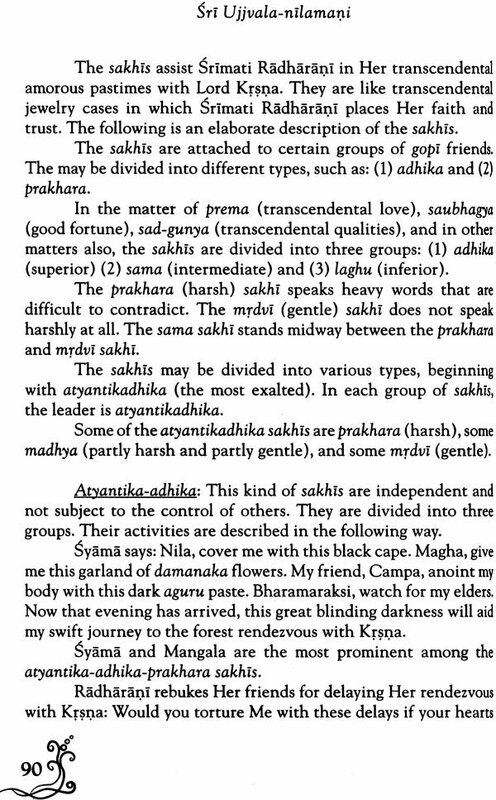 Prabhupada: Ujjvala-nilamani. No, Ujjvala-nilamani is not for general study. Prabhupada: It is, it is for high, advanced devotee. You have seen our Bhagavad-gita? The Ujjvala-nilamani deals exclusively with the subject of the conjugal relationship with Krsna, the Supreme personality of Godhead. Just as there are innumerable very sentimental songs and poems describing the love between men and women in this world, one might suppose that this literature is of a similar nature. However, the reading of this book will definitely astonish us as to what an exact and detailed study of transcendental love of God has been carried out by the author. It is said that the love of God exhibited by the pure devotees can be compared to gold whereas the so-called love between conditioned souls in the forms of men and women can be compared to iron. The truth of this statement will surely be amply confirmed by a reading of this great literature. However, as Srila Prabhupada indicates to the professor, we should first very carefully study the Bhagavad-gita before attempting to read such a book as this. 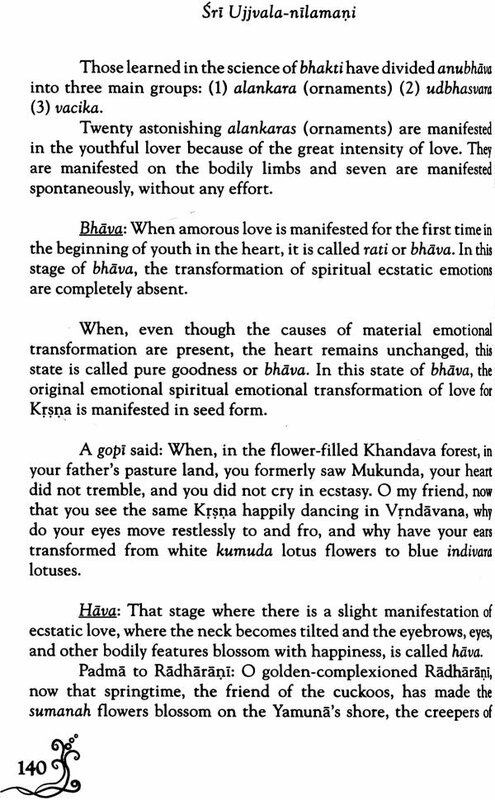 Bhagavad-gita leads us to the point of surrender to Sri krsna. After surrender, one should begin his study of the Srimad-Bhagavatam, starting with the First Canto. 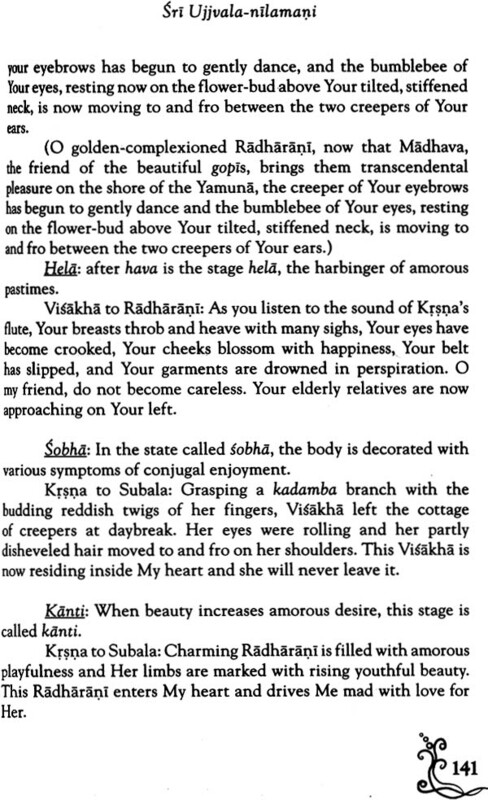 As in this book, the intimate pastimes of the Lord Krsna are portrayed in the Tenth Canto of that great work. By study of the first nine cantos, one comes to a proper understanding of the Krsna, the Supreme Personality of Godhead. Only then is one actually able to properly appreciate the Lord's transcendental pastimes, as described in theTenth Canto. In this world, as you all must know very well, everyone is engaged in a very hard struggle for existence and for the most part, our attempts at finding fulfillment in loving relationships meets with great frustration. Here is the remedy for our faulty condition of life- let us be informed that there is another world, beyond this world of birth and death. In that transcendental abode of the Lord, life goes on as it should be. The all attractive Lord is the center of everyone's attention and He mercifully merges all into a limitless ocean of transcendental loving relationships that give full satisfaction to the soul. In the Gaura-ganoddesa-dipika (180) Sri Rupa Gosvami is described to be the gopi named Sri Rupa manjari. We can thus understand that his writings are not mere products of his imagination. He is not simply blindly repeating what he had heard from previous authorities. He has first-hand knowledge of all that he describes in this book. Although he was formerly a highly placed minister in the Mohammedan government of Bengal, Srila Rupa Gosvami gave up his wealth and aristocracy and resided in Vrndavana as a perfect renunciate. Although we may read this exalted literature, the true fruit of our endeavor will be tasted if our desire to become more firmly fixed in the devotional service of Lord Krsna becomes manifest.